It's a big job keeping kids and families healthy. There's so many more temptations out there compared to when I was growing up, and kids have to learn to make healthy choices. All 3 of our kids play sports, so they get lots of exercise, and we try to enjoy that outdoor time as a family, as well. But, they also like video games and using the computer, so we have to make sure they get a balance in their activity. We're very lucky that they like most fruits and vegetables. But, sometimes as they get older and busier and eat away from home, it's harder to make sure they're getting what they need. I try to keep fruits and vegetables interesting in the refrigerator so they'll choose them while they're standing there staring at the food (you know what I'm talking about). For example, for some reason, matchstick carrots have become wildly popular around here. I guess it beats the same old baby carrots day in an day out. Whatever the reason, I'll take it because everyone is eating carrots. Fruit arranged in some sort of container seems to get more attention here, too. If I stack apples in a bowl, they go a lot faster than they do when they're just in the fridge. And, no one seems to be able to resist the call of the oranges in the little wooden crate. Additionally, Tropicana Pure Premium Orange Juice can play a part in helping people get their recommended servings of fruit since it counts as two servings of fruit, and you can drink it on the go. A 59-ounce container has16 fresh-picked oranges squeezed inside, and an eight-ounce glass of orange juice provides a full day’s supply of vitamin C, as much potassium as a medium banana, and it's a natural source of the B vitamin folate. How do you get fruit and vegetables in your family's diet? How to win: Leave a comment telling us some ways you get fruit and vegetables in your family's diet. 4. Contest ends 5:00 p.m. (PST) May 9, 2011. 4. Winners will be selected via random draw, and will be notified by e-mail. Don't forget to visit the Exclusive Offers page for even more chances to win, and visit back here in 2 weeks for another chance to win a $100 Visa gift card here at Busy Mom Reviews! We get our fruits in with fruit salad & smoothies. Veggies are more palatable to my kids if they have some dip with them. We get our fruits in with smoothies and late night healthy snacks! I have an odd child, he actually begs me for veggies, broccoli to be exact! And he loves his fruit too, so it's no problem getting him to eat it, hopefully it stays that way!! Eating fruits has never been a problem. They like some veggies, so its best to hide them in foods kids already like. For instance, add broccoli to pasta. Hopefully this is my winning tweet. I could really use $100. Potstickers are my new secret weapon. Stuffed with bok choy, cilantro, green onions, and other veggies! We started subscribing to a CSA and that does a lot to help us eat more veggies. Kale chips have become a new favorite snack. I'm trying to have a small salad before my dinner, to help fill me up with extra veggies! We love smoothies, so I put all veggies and fruit in, kids love it too much to care what’s in there. This trick works great with my picky eaters. I add veggies in casseroles and it keeps my crew healthy and happy. Fruit is easy, my boys like fruit. I make my kids smoothies every morning. They think they are fruity and yummy, but I usually sneak some veggies in them too! No kids, so here is what I do for myself. Protein shakes every morning with orange juice, fresh fruit or veggies, protein powder, and ice. Sometimes I'll throw in a few spoonfuls of yogurt. Yummy. It just so happens that we drink a lot of Tropicana at our house. We also use V-8 where tomato juice is called for in things like Chili and enchiladas, etc. We love smoothies, and my kids are always dumping extra fruit in them. I keep fresh fruits, yogurt and vegetables around the house for snacking. We also love making smoothies. I serve vegetables in cassaroles and on the side. My daughter loves fruits and vegetables. So as long as I buy them, she'll eat them. Salads & smoothies for me. I also make same. I make fruit cream salad for my child. We have orange trees in our back yard but we still buy Tropicana orange juice...go figure! 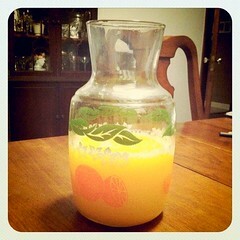 We still buy Tropicana...even though we have orange trees in our back yard! We eat fruits and veggies for snacks, and try to have fruit for dessert, as often as possible. We make smoothies and add veggies to pasta sauce. We love smoothies & berries with freshly made whipped cream. All veggies are good with cheese! I sneak fruits and veggies in wherever I can! Subbing canned pumpkin or banana for oil in muffins/brownies is a favorite, and I always add cauliflower to mashed potatoes! Thankfully we love all fruits and most vegetables. I try to make the veggies interesting - like Parmesan roasted asparagus or gingered carrots. Salads seem to be a favorite, and we always keep fresh fruit and OJ in the house! I don't have as much luck with vegetables, but I keep fruit around as our main type of snack item. I really rely on fruit juice to get fruit into my kids. I also love the juices that include a full serving of vegetables disguised in fruit juice. I use dips - anything that they can dip, they will eat. Vegetables, no problem - fruit no problem (even meat into gravy, no problem). I pretty much gave up trying and begging. That being said, I cook how I cook. That meant onions and green peppers in the meatloaf this week. He wasn't happy, but take it or leave are his options. I try to sneak veggies in where I can and ranch dip and cheese sauce help alot too. Always fruit on the counter for snacks, juice for the only drink in the house. Work alright for us. When they want a snack, I make them choose a fruit or a vegetable...after that they can have a little junk if they want. I'm really lucky. My grandkids really like fruit and veggies. We let them think they are the big "Treat" and everybody's happy. Smoothies. Tropicana orange juice, berries, and greek yogurt! Yum! I try to include a couple different kinds of vegetables every time I make a meal so I don't get bored of one certain kind and I get different nutrients. My girls will pretty much eat any raw veggie so long as they have Ranch dressing to dip it in. They also love V8 juice with fruit and veggie juice. We also love to pack raisins for on the go snacks. We try to eat more veggies and fruit. We put veggies and fruit in smoothies. fruits and veggies in smoothies! You can also pure veggies and sneak them into tomato sauce to put on spaghetti. we have veggies in lots of pasta salads and my kids love a good fruit salad! We love fruits and vegetables so there's no problem getting them into our daily diet! One thing is to vary the way your prepare your vegetables so they don't get "boring". When my kids were little, they loved fruits and veggies so I was really lucky as getting them to eat healthy was never a huge problem. Thank god, we all craved our fruits and veggies. I love sneaking veggies into really high value foods where you would never normally put them. For instance I add pureed cucumber or zucchini to my brownie mix. Since chocolate has such a strong taste and those veggies have subtle flavors you never know they're there! It’s all about presentation and finding recipes that your kids like that may have veggies in them. Stick to those and keep rotating them! My kids do like fruits and veggies, but it helps a lot if they have something to dunk them in. They will eat about anything with a little ranch dressing! Smoothies and adding veggies to sauces is the quickest and easiest way I've found. I am very lucky. My kids love love love fruit. Never any problems getting them to eat fruit. They also like quite a few veggies, so I don't push it and force them to eat what they don't like. I do introduce and reintroduce new and seasonal veggies all the time and my oldest especially will try more and more. We are a vegetable eating family so the kids and now the grandkids don’t know anything different. I used to take the boys out and pick fresh- let them see that each piece is unique, and how it grows on the tree or vine or bush. We'd grow carrots in 5-gallon buckets, just to be able to pick them. Didn't mean they ate everything then, but they sure do now. i put fruits in yogurt, pack sweet fruits for breakfast, and cook veggies with lots of seasoning to make it tasty. when all fails i also use supplements. My son has always loved all fruits and veggies so getting him to eat a healthy, varied diet has never been an issue, but I will add veggies to spaghetti sauce, meatloaf and casseroles to boost the nutrition. We also enjoy smoothies. My children are adults now, but getting them to eat fruit and vegetables was never a problem. They loved to stop at the roadside stands and pick out their own fruit. Keeping enough on hand was another story. We always seemed to need another 10 pounds of oranges. I just serve lots of fruits and veggies and figure that sooner or later the kids will eat them. We keep little junk food in the house, which helps because they do get hungry. If it is choice between hunger and an apple they will eat an apple. I leave a veggie tray on the table with their favorite dips so that my family has something healthy to snack on in between meals. I feed my children fruits and vegetables every day. I get them to eat their Vegetables by seasoning them with good tasting seasonings and herbs. Sometimes I will add a light cheese sauce. As long as I season them or add a light cheese sauce, they don't mind eating them. They LOVE Fruit, so it is never a problem to get them to eat it. I try to hide the veggies in the sauce. We drink smoothies to get our fruits in - we love them! We love veggies if they are roasted or grilled!